09:00. It rained almost non-stop overnight but the ground at the site is still quite firm. As promised the JCB digger was on site bright and early though the rain seemed set to stay. A new face on site today was Fiona Macdonald (small "d" notice). She was very easily recognised by a bright (almost gaudy?No) hat in the style of those worn by Tibetan monks. Not to be outdone, Liz, who has a certain commitment to the red & whites, donned her red Sunderland AFC hat and a broad smile as she remembered the wonderful goalless draw she watched against Arsenal last Saturday. 09:05. 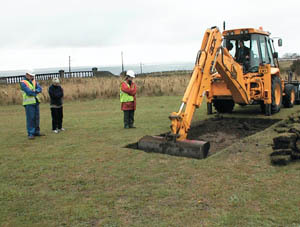 It was with some trepidation that the inexperienced among us watched the JCB begin extending the excavation of Trench A. We need not have worried. The driver worked carefully and accurately and the whole group was soon convinced that there was no risk of damaging any skeletons which might be hidden beneath. Indeed the main reflection concerned the speed with which the machine moved the earth compared with yesterdays efforts with shovel and trowel. All the while the rain continued to fall gently. The JCB removing earth at Trench A. The tarpaulin covers the rea of yesterdays finds. Seaham Hall can be seen in the distance, top left. 09:45. 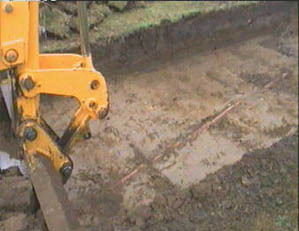 The JCB has completed its work on Trench A. 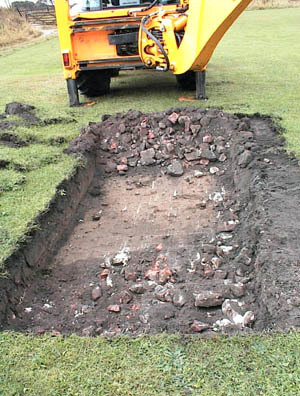 In order to ensure that the possibility of damage to any skeletons was minimised the machine left about 4" of earth above the level of the previous finds here. So the group working on Trench A are soon back on their knees scraping away at the surface. 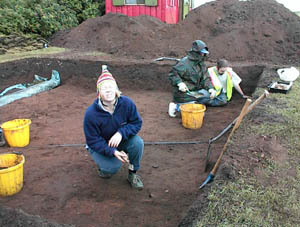 Fiona (bottom) and Liz pose for the Dig99 Daft Hat Competition but will soon be back to work. Fiona's hat has magical powers so she prays for the rain to stop. Lyn (disguised as Darth Vader) & Jamie seem to have cornered something mysterious. Lyn is taking no chances and has her shovel at the ready. Trench A has been widened to 5mx5m by the JCB. The electrical cable , which appears to supply the Vicarage was successfully negotiated without damage. 09:50. The JCB has stared work at Trench B now. The team are trying to identify the nature of a ditch-like feature which appeared on a magnetic scan of the area which was made before digging began. 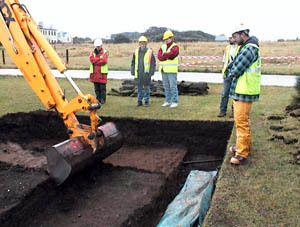 The only feature found in Trench B was an old red field drain. 10:00. The JCB has left Trench B which will now be discontinued and is at the edge of the Flower Show Field just north of St Marys Church. 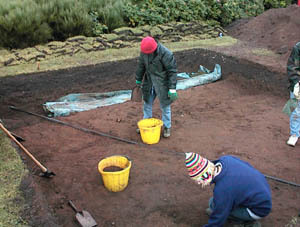 Jim has decided to open a new trench (Trench 4) here. 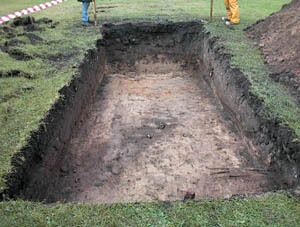 It is hoped that excavation here might give some clues about previous building at this location though he is approaching this with an open mind. In the event a trench 5mx2m reveals a lot of relatively modern (perhaps Victorian) building rubble down to about 60 cm. Though there is a lot of sandy ground beneath this level surrounding an interesting darker, linear feature which will need further investigation. No bones are revealed in this trench but it is interesting to note the large number of worms living in the earth from which the dark feature is composed. hand corner merits further investigation. 10:15. The team working in Trench A have uncovered another skeleton though it is to be covered up to protect it. Weather conditions are not really suitable and Jim has abandoned any idea of exhuming skeletons today. 11:00. Break time has ended and the JCB is used to open-up two more trenches D and E.
12:00 Noon. D and E completed.Their positions are now included on the map of the site. Rain more or less stopped play in the afternoon. Fingers crossed for tomorrow - the TV cameras are coming.